When you have a flat roof on a building or house, it’s necessary to build and maintain the roof so that you do not have long-term problems. Flat roofs are notorious for having areas where ponding occurs, and we’re going to discuss some of the problems that can occur with that ponding, and what you can do about it. Having a flat roof on any structure can be a maintenance nightmare. And adding to the problem is the situation when a flat roof holds water. The problems that can occur with ponding water are many, so let’s explore a few. Obviously, water can be very heavy, and that extra weight that water can bring with it can cause disastrous results to the structure of the building. The weight can cause areas to actually fail and start to sink more, therefore adding more weight, and compounding the problem further. This weight can be bad for the structure, the foundation, and the roofing membrane itself. In some cases, they could cause catastrophic failure all together. In addition to the structural problems that standing water can attribute to are other problems like insect breeding opportunities, debris buildup situations, bird and animal waste collection, mold and mildew, ice buildup, and damage to the roofing membrane and drains. The number one killer of a flat roof is ice. The most damaging thing that can happen is when the ponding water has the opportunity to freeze, and for ice to break apart your roofing membrane. When the water that is standing on a flat roof freezes, it expands 12%. 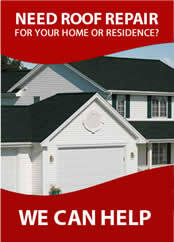 Any areas where water has made it down into the cracks of your roof will expand 12% more than what it already is. The solution to the above problem is to never have water on the roof in the first place. Flat roofs can easily be turned into a pitch to roof by adding components that would, in effect, ‘taper’ the roof, adding what equates to a downhill for runoff. Typically, foam or insulation will be cut to a pitched angle, and water diverted off to the drains. This requires some forethought, and a plan must be drawn up so that the insulation can be properly ordered an installed at a later date. An insulation plan, like the one to the right, will give you a great water runoff, with little or no standing water. 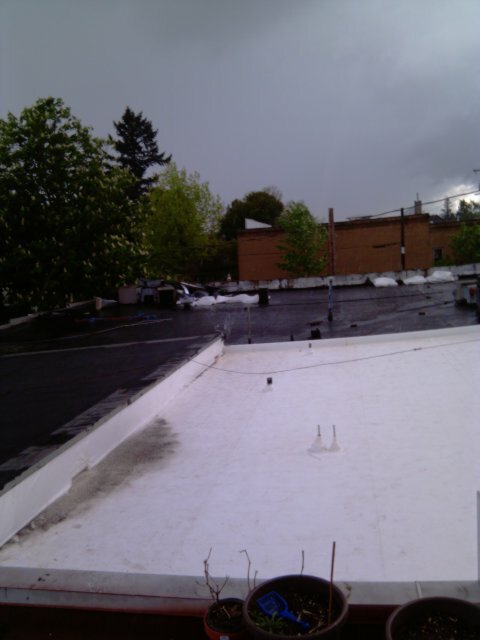 A Portland roofing contractor can provide a professional estimate and layout for this type of water diversion system. 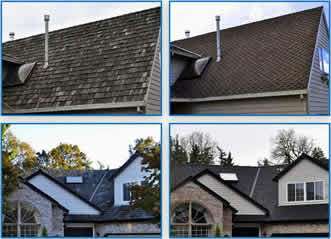 Usually, this is done when a new roof is installed. Ponding water does not need to be something that you live with. With a roof taper designed properly for your home or business, all of the water can be made to go down the drains, thereby eliminating any weight, insect breeding areas, ice dams, or stagnant water odors. Because of foam is lightweight, you’ll be adding very little weight to your existing structure. Accompany this with a brand new PVC membrane roofing system, and you will have a lifetime warranted maintenance-free roofing system.